The goal of ACToday is to create climate service solutions to end hunger, achieve food security, improved nutrition, and promote sustainable agriculture. We are embedding the best possible climate knowledge and services in the agendas and programs of the SDG2-relevant national institutions and key development partners in a selection of priority countries. 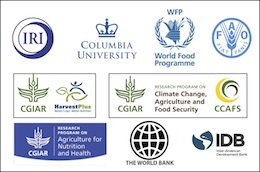 We are working with partners to identify measurable impact and evidence of utility of climate services in food system risk reduction and the benefit this has on SDG2 outcomes. We will seek to scale best practice to all countries identified by global partners as particularly in need.